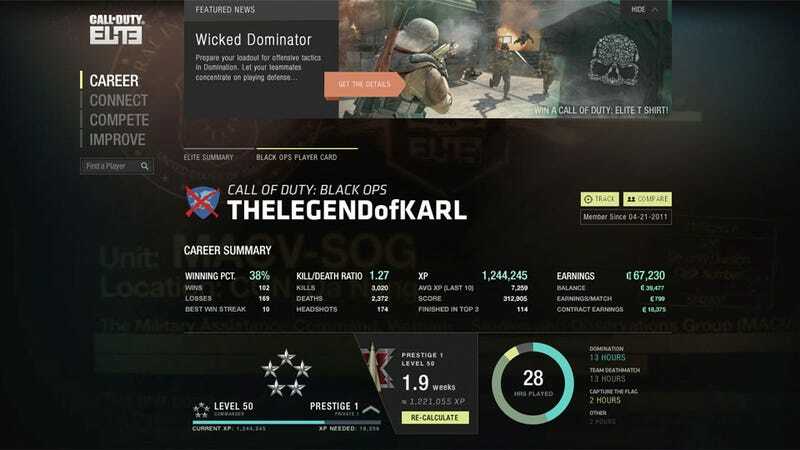 Call of Duty Elite, Activision's new social network and stat-tracking service that will launch alongside Modern Warfare 3—and work with last year's Call of Duty: Black Ops—is largely going to be free to use. But there are very good reasons for investing in Elite. At the war game maker's Call of Duty XP gathering, Activision Publishing CEO Eric Hirshberg finally put a price on the premium subscription it plans to offer to Call of Duty Elite members: $50 USD per year. That's ten dollars less than the cost of purchasing a year's worth of downloadable map packs at $15 a pop, Hirshberg says, which millions of Call of Duty fans seem content to do annually. Players who purchase an annual premium membership to Call of Duty Elite will receive "every piece of downloadable content [for Call of Duty: Modern Warfare 3] for the year," Hirshberg said during a press preview at this weekend's Call of Duty XP convention. He estimated 20 pieces of content in all, including map packs, missions for Modern Warfare 3's Spec Ops mode, additional unspecified game modes and more. Premium Elite subscribers will also get it first and faster, he said. "In the past, we offered it four times a year," Hirshberg said of standard Call of Duty map pack releases, typically sold as a bundle every few months. "Premium will get it monthly." Maps and other content downloaded via one's premium Elite subscription will still be yours even if you let your premium membership lapse, the company said. Players won't be required to maintain an ongoing paid subscription (a la Sony's PlayStation Plus) to access their digital goods downloaded through Elite. Premium Elite memberships also allow players to take part in daily competitions for virtual and real prizes—iPads, for example. Activision says these competitions "aren't just for the pros." Players of all skill levels can take part, they say, with competition matches "managed and refereed by real people 24/7." The premium subscription fee also lets players level up their Elite clans through specific challenges. Leveling up one's clan unlocks virtual items like camouflage for weapons, badges and name tags, even double XP weekends on a clan-by-clan basis. It also includes video storage capacity eight times what a free membership offers, access to "expert strategy and analysis from the best players in the world," and the ability to watch Elite TV, the premium episodic video content being created by Hollywood talent like Will Arnett, Jason Bateman, and Tony and Ridley Scott. Bateman and Arnett will deliver "Noob Toob," which Hirshberg described as "gamers provide the videos, they provide the smack talk." The Scotts will bring "Friday Night Fights" to Elite TV, a program built from Modern Warfare 3 game footage. Call of Duty Elite's annual premium membership will cost $49.99 USD, according to Activision. Players will be able to subscribe via Xbox Live Marketplace and PlayStation Store. Activision also expects to sell Elite memberships at GameStop stores. It will also include one year of premium Elite membership to players who purchase the Call of Duty: Modern Warfare 3 "Hardened Edition," Activision confirmed. Call of Duty Elite, currently available in beta form as a web-based client, will also come to consoles (Xbox 360 and PlayStation 3) and mobile devices (iPhone, iPad and Android). I got a chance to preview the Elite interface for the Xbox 360—a free downloadable application, I'm told, just like the mobile versions—and found it identical to the web interface. Elite's mobile apps may feature less functionality than the full-sized versions, but Hirshberg promises iOS and Android versions will still be "deep and rich." Call of Duty Elite launches wide on November 8 alongside the release of Modern Warfare 3.